Sometimes, you want to record a footage, but you can’t exactly use a full-sized professional camcorder. In such case, you should consider using a compact and portable video recorder instead. While there can be some features that are compromised, you can be certain that a compact video recorder can also record outstanding videos. Well, that is, as long as you choose the right product to use! Now, we have Canon Vixia Mini X and Sony HDR MV1. These two products are among the most popular models on the market right now. Which one is the most suitable for you? Let’s compare them! 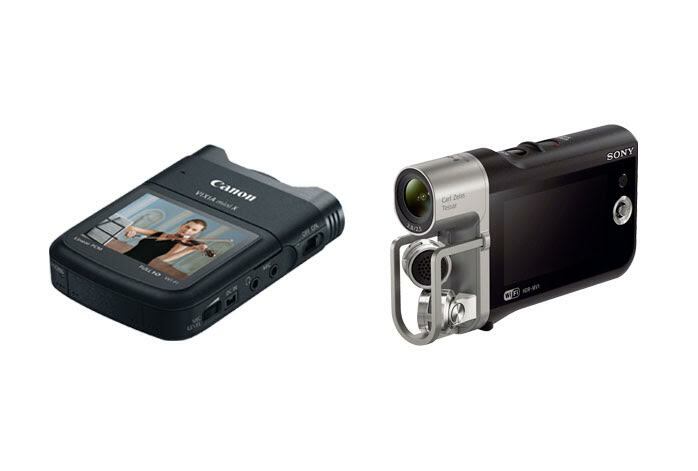 Truth to be told, Canon Vixia Mini X and Sony HDR MV1 are both very compact and portable. You can say that Canon Vixia Mini X is, more or less, the horizontal version of Sony HDR MV1. The lens is placed on the front side, with the stereo mics on the left and right, while the display screen is placed on the top side. Canon Vixia Mini X is very easy to use and handle. On the other hand, Sony HDR MV1 can be said as the vertical version of Canon Vixia Mini X. The lens is put on the front and the pair of stereo mics are put right underneath, angled in a 120-degree X/Y configuration to allow the capturing of realistic and accurate audio imaging. The display screen is on the left side. Such design is very convenient, especially for a single-hand operation. Take a look : Sony HDR-MV1 vs. Zoom Q8. Sony products are often loved because of the excellent low-light performance, and Sony HDR MV1 is not different. It has very low grain in a low-light condition, and it is able to reproduce full and solid colors. It also captures excellent stereo sound, thanks to the smart design of the stereo mics. Unfortunately, it can only record videos in a maximum quality of Full HD 1920 x 1080 at 30fps frame rate. It records into the MP4 format. On the other hand, Canon Vixia Mini X boasts the capability to record Full HD videos in MP4 (30fps or 24fps) as well as in AVCHD (60fps). Such versatility is very beneficial, especially if you often need to use your videos for different purposes. With Linear PCM audio recording, the sound quality is outstanding. It also comes with selectable modes and audio scenes for easy and practical adjustment. - Canon f/2.8 fisheye lens offers a unique and creative perspective. - Record Full HD video in MP4 (30p/24p) or AVCHD (60i) format to a removable SD memory card. - Shoot in Wide mode, or choose Close-up mode ¬with image stabilization to help correct camera shake. - Powerful LPCM and AAC for recording versatility. - Capture wide stereo sound with 120 Degree X/Y mic. - High-quality 30p HD video with low grain in low light. Finally, we would like to recommend you to choose Canon Vixia Mini X. The recording quality is better, and, thanks to the selectable recording formats and scenes, it even has the versatility needed to handle any condition and purpose.